The family history of Thomas John Tuck is the same as for his brother Francis Douglas , so please click on the link to Douglas’s page to read this. UK, Soldiers Died in the Great War, 1914-1919 accessible on www.ancestry.co.uk confirms Thomas’s regimental information and tells us that he enlisted in Hawarden and was buried at sea. His medal Card, also on ‘Ancestry’ details his medals and tells us that his first Theatre of War was the Balkans and he entered it on the 8th August 1915. 14 days later, on the 22nd August 1915 he died. There is an index card for Thomas J Tuck in The Flintshire Roll of Honour at The County Record Office in Hawarden. (Card Harwarden F34). The address given is Main Street, Hawarden, and his regimental details are confirmed. He served for 1 year & 18 days and died August 22nd 1915 and was buried at sea. He served in Gallipoli. The Card was not signed or dated but was in the same handwriting as Thomas’s brother, Francis Douglas’s card. I believe it was written on the same day by their Father John. Monumental Inscriptions T 7 Churchyard extension. (John Henry & Susan Wyatt Tuck, had suffered the loss of another son, Charles E. in 1893 age 1 month). 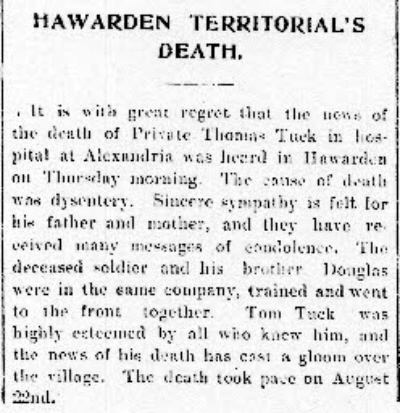 Hawarden Territorial’s Death – It is with great regret that the news of the death of Private Thomas Tuck in Hospital in Alexandria was heard in Hawarden on Thursday morning. The cause of death was dysentery. Sincere sympathy is felt for his father and mother, and they have received many messages of condolence. The deceased soldier and his brother Douglas were in the same company, trained and went on the front together. Tom Tuck was highly esteemed by all who knew him, and the news of his death has cast a gloom over the village. The death took place on August 22nd. I am sorry to say three of them are dead now. I saw two – Harry Williams and Jenkins, Poor Tom Tuck died in hospital. Harry Williams was bending to pick up a wounded man when he got it in the head. Both belonged to my platoon. I wish to send my deepest sympathy to his mother and all the family, and also to Tom Tuck’s parents. Douglas Tuck was going on all right when I left him. He has since died. Part 3 of the service above. The following newspaper cutting was given to me at an event about WW1 that took place at Mold Library. It was from the Edmonton Journal (Canada). The article is from a story told by Bill Smith to the editor of the paper Stephen Hume in 1986. He talks of his reasons for leaving Hawarden after the hell of the Dardanelles. Harry Williams* features in these extracts as do the Tuck brothers who are also named on Hawarden’s memorial and have their own pages on this website. A Postcard (see below) from William Harding to Mrs. Tuck shows how close the boys from Hawarden were. “3292 G. Company, L’pool Scottish, King’s Park, Edinburgh. A Postcard (see below) from possibly Harry Williams, a Stretcher Bearer like Tom and Douglas, to Tom. Both these boys are on the website, please click on the links to read their stories. The late Mr. J. Tuck – The funeral took place on Wednesday week of Mr. John Tuck (82), retired shoemaker, 1 Aston Mead, Aston,, who died in the Old Rectory Hospital. Mr. Tuck came to Hawarden Orphanage about 75 years ago with his brother William. On leaving school he became an apprentice shoemaker with Mr. Wm. Roberts, who had his shop down the entry – still in existence – between The Glynne Arms and the Midland Bank. He later opened his own shoemaking business in the village. He had been a widower for 20 years. 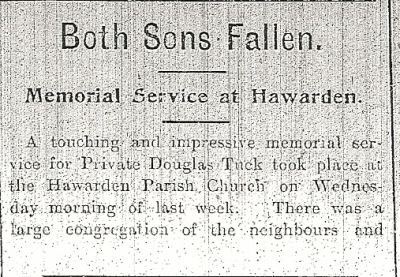 His two sons, Douglas and Tom, were killed in the 1914-18 war. 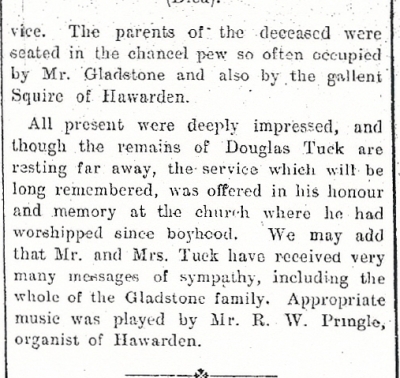 Mr. Tuck was the godson of the late Viscount Gladstone, the late Lord Gladstone of Hawarden, and Mrs. Potter. He was a Churchman, member of the choir, of the Hawarden Volunteer’s Band and interested in all forms of music and the garden, his pride. The Rector officiated at the funeral service assisted by the Rev. Tecwyn Jones. The choir were in attendance, and the organist was Miss Marian Williams. The family mourners were Miss A. Tuck, Mrs. W. Tuck, Cissie, Ethleen, and Davida (nieces), and Mr. and Mrs Massey. The bearers were Messrs. F. Buckley, A. Catherall, E. Cannon, and R.P. Phillips. 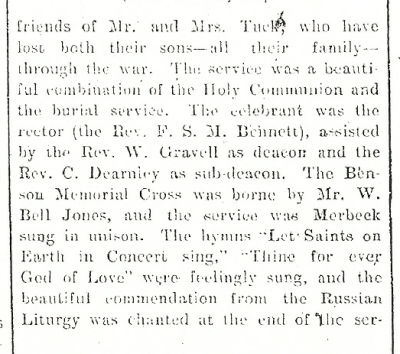 Messrs. G. Bailey and Sons were the undertakers. Front of Postcard from Will Harding - 1914 just after War was declared. Postcard addressed to Mrs Tuck from Will Harding, who also died and is remembered on the War Memorial. Front of Postcard sent to Tom at Hawarden from Harry. I believe this could be the Harry Williams, who also died and is remembered on the War Memorial. Thanks to Paul Hancock who has this plaque in his collection.